After 10 years and 25 fights, Michael Bisping had just two weeks to prepare for the biggest fight of his life. But in his first ever title shot, he stunned the world, knocking out Luke Rockhold to become Middleweight champion. In the co-main event, Dominick Cruz and Urijah Faber finally put their bad blooded rivalry to rest, as the Bantamweight champion retained over a clinical five-round performance to further assert his dominance at 135 lbs. Meanwhile, Max Holloway picked up a ninth straight Featherweight win, outclassing Ricardo Lamas and Dustin Poirier's Lightweight resurgence ran straight through Bobby Green. In what also could have been Dan Henderson's final fight, he saved perhaps his best knockout till last, sending the Californians into delirium with a vicious elbow knocking Hector Lombard out cold. On a night where the world mourned the loss of an immortal icon in The Greatest, Muhammad Ali, the UFC paid a fitting tribute as the fighters left it all in the cage in his memory. Polo Reyes and Dong Hyun Kim produced a fight of the year candidate even when fans were hardly even queueing up outside The Forum, kicking off the early prelims with a bang to say the least. Mexico's "El Toro" left with his hand raised thanks to a blistering third-round TKO, but before that, war was waged in the Lightweight division, both men took heavy shots, standing at point blank range and trading with reckless abandon. 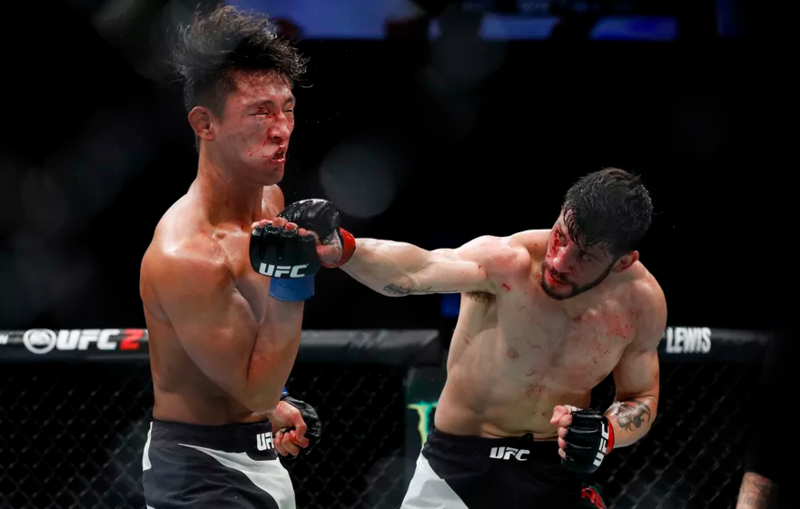 But with the South Korean withering, even though he had his opponent back pedalling at multiple stages of the contest, one shot would leave him on the canvas and enough was enough for referee Mike Beltran, at one minute and 52 seconds into the third frame. Son-in-law to the late, great Muhammad Ali, Kevin Casey would share the spoils with opponent Elvis Mutapcic after three hard fought rounds to follow up from the craziness of the night's opener. Despite some well-timed takedowns which left the Bosnian grounded and mounted, a big third round for Mutapcic gave him the win in one judges books, as was the case with Casey, while the third scored it a draw, giving the overall decision. 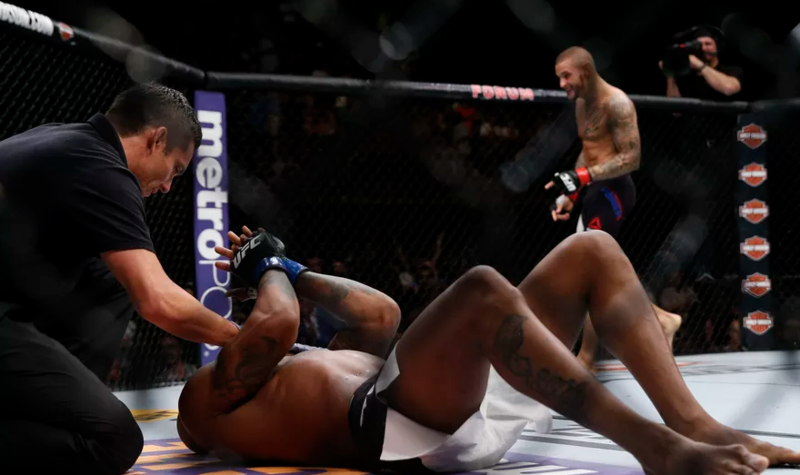 Luis Henrique da Silva made good of his UFC debut while maintaining his undefeated record in the process as he forced a stoppage of Jonathan Wilson at the culmination of a sequence where the eventual winner was dropped first. In the realms of the Light Heavyweight division, both combatants were well matched, but as fatigue built in, and the fight hit the mat, a sensational sweep by da Silva before a mount and heaps of punishment brought an end to the action. Britain's Tom Breese saw his 100% win record snapped by Sean Strickland over the course of three, at times uneventful, round s. A closely contested fight which could have went either way was ruled a split decision in favour of Strickland, with both men making it a kickboxing match in the early stages, before later grappling would tilt the bout in favour of the American, concluding the early preliminary portion of the event. 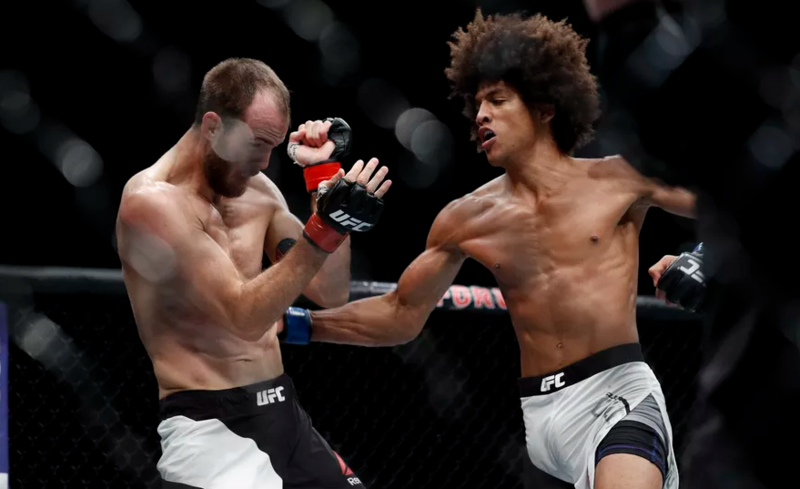 Moving over to the televised section of the card and entertainment continued to flood in, this time a result of the mind-boggling Featherweight battle between Alex Caceres and Cole Miller in which the former took a victory through the judges' scorecards. "Bruce Leeroy" took an early advantage by applying pressure on his compatriot, staggering him up against the cage with some huge strikes, even with a few opportunities to showcase his grappling as he hurled his opponent across the Octagon. But the pace would elevate to a frantic tone in the third, with Miller, aware that he was down on the cards, going for broke with an armbar and choke attempts; just falling short however as Caceres pulled through for the unanimous decision. Jessica Andrade then announced herself to the Strawweight division with a dangerous alarm bell as she obliterated her namesake Penne en route to a second-round TKO victory. The former title challenger was overwhelmed by Andrade who cut down to the division, unleashing heavy strikes and ripping to the body, leaving her opponent staggering to the canvas at the end of the first. More of the same followed in round 2, before enough was enough, and Penne succumbed to the punishment. Perhaps eye pokes are the way to light the fire of a fighter - that certainly seemed the case when Beneil Dariush steamrolled past James Vick for a massive win where the Iranian showed huge strides of improvement. The final result saw Vick clatter to the canvas like a ton of bricks from a mean left hand, but that was all set up from the repeated landings of the shot throughout the fight, with the legs of the taller fighter going and leaving it at the mercy of Dariush to finish. Brian Ortega left it incredibly late, but all it took was one flush knee to the face of Clay Guida with seconds remaining, and "T City" found his 11th win. But it was far from plain sailing throughout; with Guida applying the pressure and causing all sorts of trouble for the American on the feet, eliminating the grappling equation for the most part. But with less than a minute on the clock, and the pressure on, Ortega kicked into gear, had Guida back tracking, and timed a knee perfectly putting his opponent so out of it, he tried to fight the referee at one point. A resurgence at Lightweight continued for Dustin Poirier in style as the "Diamond" dispatched Bobby Green midway through the first round for a fourth-straight win in the division. Ultimately, the "King", returning after a year and a half, would be his own downfall, with the demise beginning when his opponent caught him flash midway through his patented in-combat trash talk. But the ever resilient Green remained undeterred; while up against the cage he continued to withstand the punishment offloaded by the Diamond, although unable to stabilise after his attempts at psychological warfare went south. Prior to that, it was a case of both combatants trying to take each other out while keeping safe, and all would change when a final shot against a backtracking Green sent him down to the canvas, before Poirier swarmed with some ground-and-pound to pick up a first-round knockout. Following the fight, the "Diamond" asked for top ten opposition which, after this performance, is more than justified. He is a rejuvenated force in this division, and at each outing continues to demonstrate new parts of his game. As for Green, the ring rust question once again surfaces, with around a year and a half outside of the cage potentially contributing to his loss. Dan Henderson scored one of the best knockouts of his entire career, in potentially his last outing as he knocked out Hector Lombard with a stunning back elbow in front of a pro-USA crowd. Hector Lombard started off very respectful of his opponent's power, slowly stalking down the MMA legend and we would soon know why he was so cautious, as he was sent wobbling backwards at the hands of a right-hand from the American. But, although a veteran in the sport, Henderson was somewhat youthful in his approach to try and finish Lombard, rushing forward, and then himself getting dropped with a left hand. The Cuban took the opportunity to control Henderson on the ground and even manage to get him in crucifix at one point, but a few unsuccessful submission attempts later and the fan favourite was back on his feet - not with all his bearings though. As soon as he was back up, Lombard swarmed on him, and had him in trouble backing up, dropping him late on. But, remaining durable as ever, Henderson got to the end. With The Forum roaring on for a second round, Hendo was eager to get back into the pocket, even incorporating some head kicks, one of which took Lombard off his game and set up for one of the best knockouts of his entire career. A backwards elbow to the head of the Olympian, after he crouched to try and grab the leg, would render him unconscious, and as Herb Dean scrambled to conclude the fight he landed one elbow on the ground and that was that, California erupted in celebration. An emotional Henderson took it all in, as he revealed it could have been the last fight of his career pending some decision making. But if it was, what a way to go out - he left the best knockout of his career till the last, perhaps. It was another sensational slugfest as part of a spectacular card. 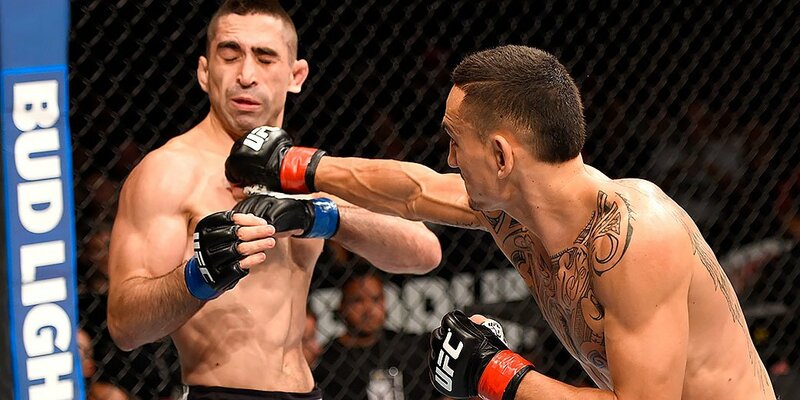 Max Holloway further staked him for a shot at the Featherweight gold as he dominated Ricardo Lamas over the course of three rounds through some clinical work on the feet, yet again showing his improvements on course to a ninth straight win. The Hawaiian showcased more of his developed skills as he controlled the pace and nullified Ricardo Lamas' wrestling in the first round. He was unloading with some lightning fast combinations that troubled his counterpart at the edge of the cage, while throwing a wheel kick late on which did connect and get the attention of the former title challenger, manning the centre of the Octagon throughout. Further onslaughts would follow in the second as Lamas' wrestling yet again failed to change the complexion of the fight. The blue-cornered fighter was getting lit up in exchanges but he did manage to tag Holloway a couple of times during those wild encounters. As the round wore on, Holloway secured a reverse guillotine attempt off a takedown but lost it, and after an unsuccessful choke attempt later on, mounted and pummelled Lamas to the bell. Knowing that he was down two rounds, Lamas was in need of something special to walk away with the win, but couldn't pick it up in the final frame. He landed more lethal punches and swung hayemakers in Lamas' direction with the clock ticking down, and even though he was miles ahead on the scoreline, he pointed down to the ground and signalled Lamas to trade it out, both men swung for the fences for the final seconds before the judges determined a clean sweep for Holloway, winning by a 30-27 unanimous decision. Putting an exclamation mark on the performance with a declaration of his desires to get to the top of the division, Holloway's post fight interview was one of character and furiosity, campaigning for a UFC Hawaii card in the process. Dominick Cruz and Urijah Faber finally put their rivalry to rest in what was a five-round fight controlled at will by the champion, dropping Faber twice and hurting him on several other occasions to further rebuild his empire of dominance over the division. With a final chapter left to add to their bad-blooded trilogy, both rivals met in the centre of the Octagon with Dominick Cruz getting into his flow early, staying out of range but also able to pepper the Californian with strikes at will. "The Dominator" also pressed the challenger up against the cage, before a short interval for Urijah Faber to pull his shorts back up. There were plenty of wild sprawls and grappling exchanges, with Faber planting Cruz onto the canvas with a mighty slam, only for the champion to scramble away and end up on top. 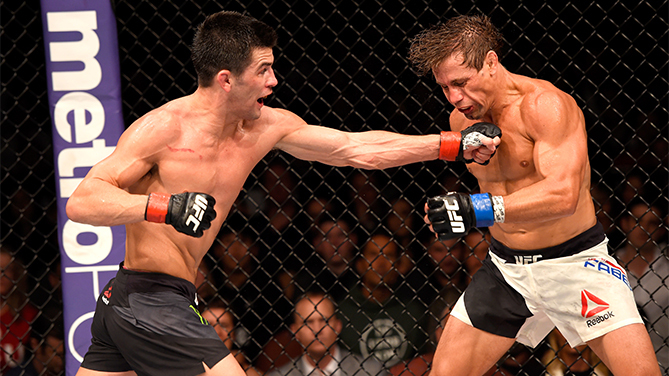 Putting an exclamation mark on his slender first round lead, Cruz landed a left hook to rattle the bells of Faber. Dominick Cruz really took control of the driver's seat with a straight left sending his opponent backwards and onto the canvas, but walked into an upkick on the way down. He remained in control on the ground before things came back on to the feet where Cruz continued to excel; equipping more head and body kicks and another left hand landing on the mark. The Bantamweight king controlled the tempo of the fight through the third round, with Urijah Faber lost of ideas to pull the trigger as Cruz continued to ghost in and out. Still, after waging war for 15 minutes there remained some bad blood, as the opponents barged into each other at the end of the third round. In the championship rounds, Dominick Cruz was certainly hunting for the finish and came close, when he tagged Faber again, sending him pedalling back towards the fence, and unleashing shots to the side of his head, before a head kick on the break. Despite this, Faber was able to continue and while well out of the fight on a scoring standpoint, he had it all to do in the fifth. And he couldn't do much. He got hurt in the clinch, while Faber controlled on the ground yet again, in another round for Cruz. When the final buzzer sounded, the two seemed somewhat reluctant yet obliged to embrace, and even though they can't stand each other, respect was evident after five rounds of fighting, appearing that the trilogy is complete and the rivalry has been put to bed. Respect was acknowledged to one another as the post-fight interviews were conducted, with Faber doubtful over his future as he yet again fell short of UFC gold. As for Cruz, more challengers await in the shark tank that is 135 lbs, but he may be the very best of them with a clinic in his first title defence in this reign. 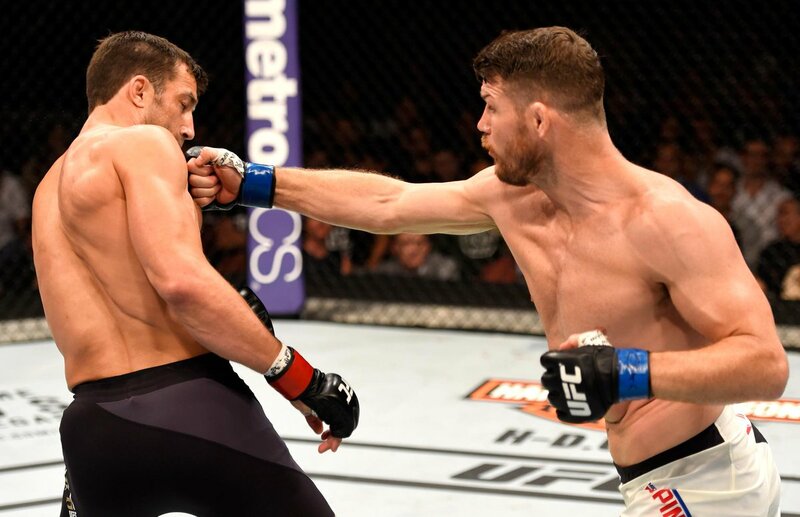 Rockhold kept Bisping at range with some body kicks early on, but all it took was one left hand shot to take the champion off balance, and Bisping swarmed with more shots before the finish. INCREDIBLE.